Two Siwertell ship unloaders delivered to the TPC Talin Power Plant, Kaohsiung Taiwan, recently set a record in through the ship capacity during commercial discharge of a bulk cargo. The Siwertell ship unloaders were tested in December 2010 with the MV Taipower Prosperity II. The cargo was unloaded by two heavy duty Siwertell ST 940-DOB units. This model is one of the largest Siwertell ship unloaders ever supplied and is designed to unload coal from ships of up to 150,000 dwt with a rated capacity of 2,200 t/h per unit. As part of the contract with the customer, Cargotec had to prove both, the rated capacity and the average capacity. The average should be minimum 70% of the rated capacity. The two units have a combined rated capacity of 4,400 t/h and therefore they should be able to unload a minimum 3,080 t/h on average throughout the entire discharge of the ship to fulfil this contractual obligation. 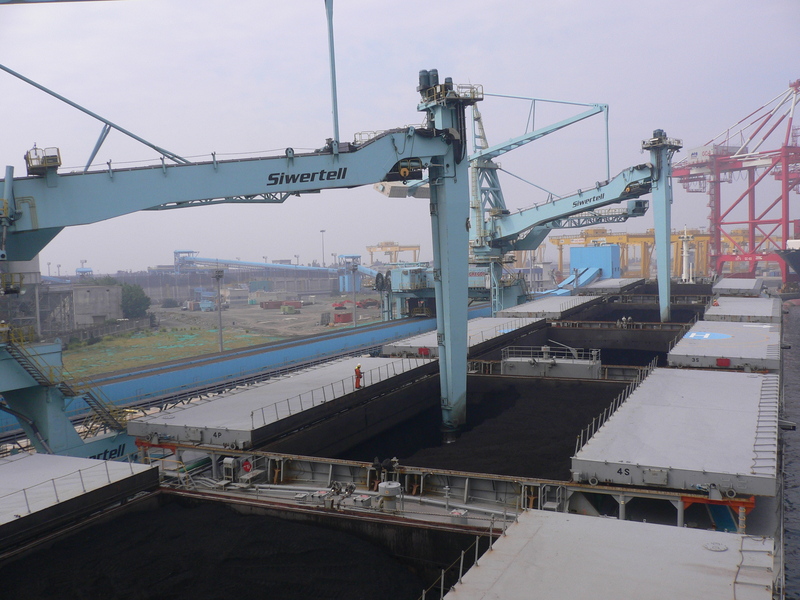 The MV Taipower Prosperity II was loaded with 89,000 tonnes of coal. Following the test, Tony Aronsson, Cargotec's Site Manager, Taiwan Branch, summarised the figures: "The test results make attractive reading for the Taiwan Power Company as well as for Cargotec. Both units passed the rated capacity test, which was to show 2,200 t/h during one hour's operation. For the average capacity the two Siwertell ship unloaders achieved an average of 3,339 t/h equal to 76 % of the rated capacity. But more importantly, Siwertell Unit one had an average capacity of 1,592 t/h and Siwertell Unit two had an average capacity of 1,747 t/h, so the best unit had an unloading efficiency of 79%. This is a record performance for Cargotec equipment and I believe these are probably the highest through the ship capacity figures ever achieved." In addition to the high capacity, one should also remember the other advantages of the Siwertell unloading system, such as dust free operation, high reliability, easy maintenance, the friendly SIMON HMI system and the high level of service from the Cargotec crew. Photo 2: Two Siwertell ship unloaders unloading coal. Transport from the ship's hold to the coal storage domes is conducted completely enclosed in order to minimize the environmental impact on surrounding areas.